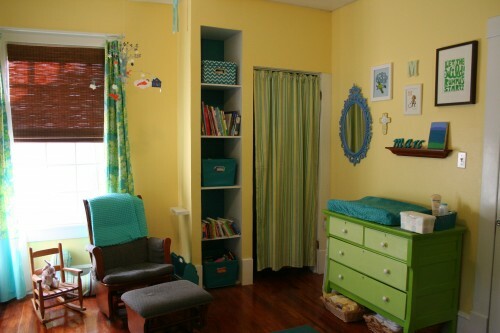 I wanted to create a bright and cheerful room that could work for either a boy or a girl. I didn’t want it to be “themey” but rather based around color, so I found some fabric that I based the whole room around. We ended up using this fabric for the curtains. I loved the greens and blues in it. 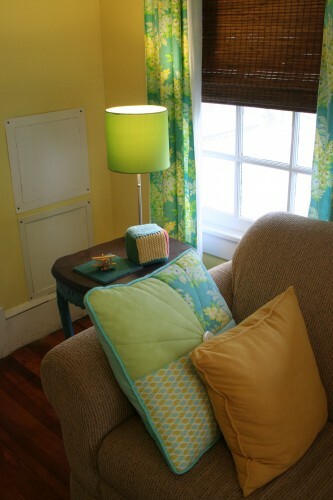 The curtains were made by my mother-in-law and have a band of turquoise at the bottom. There are a lot of windows in the room and it required a lot of fabric. 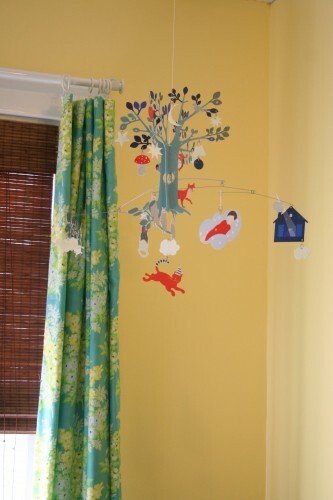 We picked a nice cheery yellow for the walls – Glidden’s Buttercup, color-matched to Benjamin Moore paint (the only paint my husband thinks is worth anything…) and used some of Behr’s Bamboo Leaf and Peacock Feather for other accents in the room (we’ll get to those later). 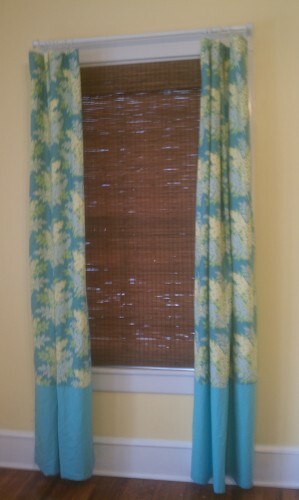 We bought the bamboo roman shades at Home Depot and cut them to the width of the windows. We can never find exact matches for the old windows in our house and these shades are easy to cut to size. We found both the sofa and the ottoman on Craigslist. The pillows are from Target (green & blue), Pier One (yellow) and the bigger quilted ones were made by my mother and my cousin. I found the side table on Craigslist and it was already refinished with dark turquoise legs! I didn’t have to do a thing to it! The green table lamp is from Target. The crib is the Sundvik crib from IKEA. White and simple and inexpensive. 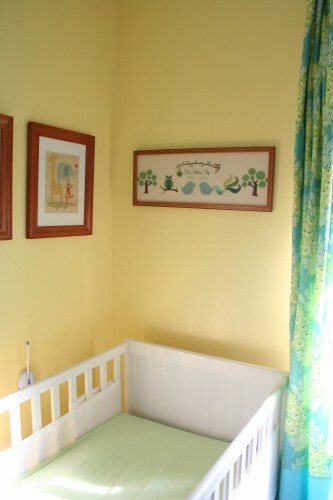 We opted for simple white mesh breathable bumpers and rotate pale green, blue and yellow crib sheets from Target. 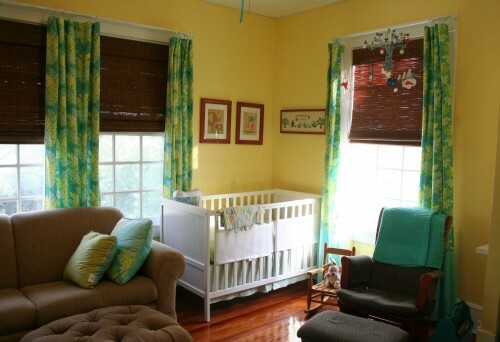 The art over the crib on the long window wall was a gift from my mother-in-law. It’s from Petit Collage, and while I’m not sure where she bought those, I know you can find it on Etsy. The other art is the cross-stitch birth announcement lovingly made by my mother. She’s been making cross-stitch birth announcements for years for numerous friends and family and I gave her a challenge with this one. 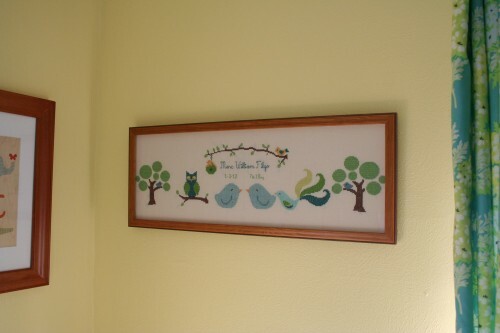 I think a lot of child-oriented cross-stitch design is too overly sentimental or kitschy, so I found a neat Etsy shop that sells simple graphic bird and animal cross-stitch patterns and together we came up with a design combining several of the patterns and using the colors of the room. We found the glider on Craigslist too – and I’m still considering recovering it, as the gray is the only gray in the room. Haven’t quite decided what to do yet. 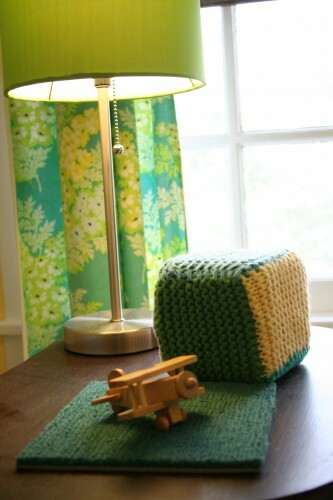 The teal blanket was crocheted by a co-worker of mine, who had absolutely NO idea that the color fits PERFECTLY in the room. We love it. The mobile was a gift from my mother-in-law. She bought it at a local art gallery. 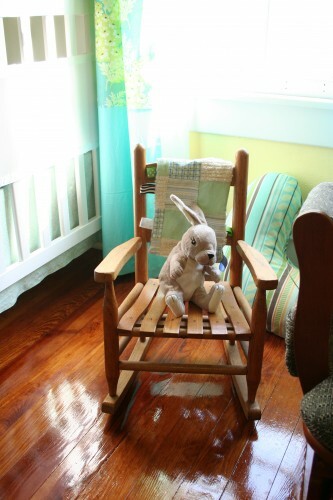 The tiny little rocking chair was my sisters’ and mine when we were little. I can’t wait for Marc to be old enough to sit in it! 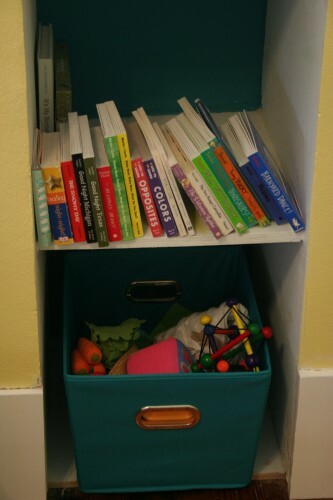 I painted the backs of the cubbies with the Peacock feather color and some of the cubbies hold Marc’s amazing, growing library and some others have some awesome storage bins from Target. 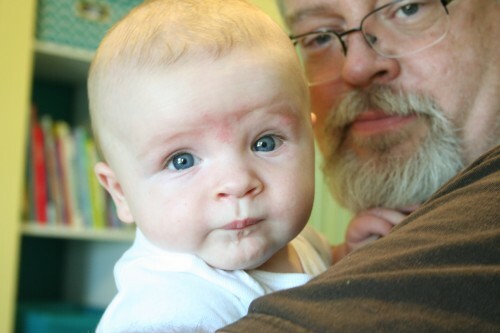 The top one holds keepsakes – his baptismal candle, several outfits I want to save – the middle one holds receiving blankets and burp cloths and the bottom one holds toys. 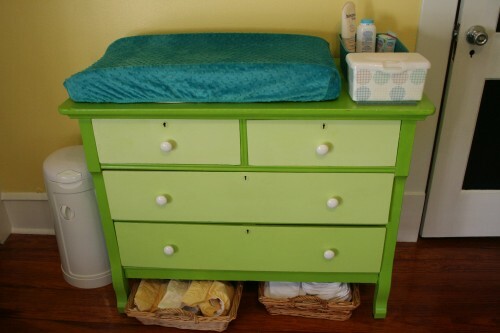 The dresser/changing table was one more Craigslist find and was a beat up old brown dresser with ugly handles and cracked drawer bottoms. My dad sanded and primed the dresser and I painted it with the Bamboo Leaf color and then the drawers with a gradation in color (we added varying amounts of white to the base color to get the other colors) to create a cool ombre effect. Kelly replaced the drawer bottoms and refaced the insides of the drawers. 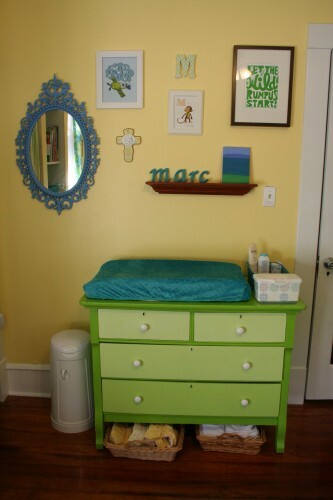 I love the way it looks, though, it’s an old dresser and has the quirks and stickiness of an old dresser. I found some old baskets lying around the house and have all of Marc’s cloth diapers and liners stacked up in them and easily accessible. I think the art wall is pretty fun and features a lot of my DIY projects. I found the mirror at a local thrift store. It was plastic and and ugly dark green. I painted it turquoise, as you can see. 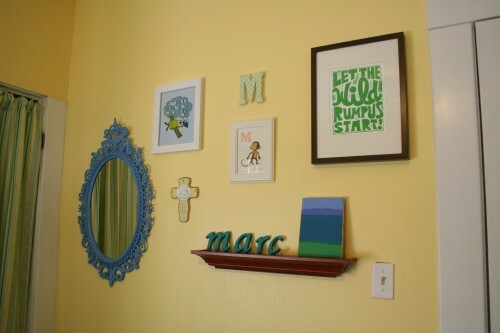 I also painted the wooden letters on the shelf and decoupaged the scrapbook paper on the M hanging on the wall. The art is from Etsy, mainly. The “Let the Wild Rumpus Start!” from “Where the Wild Things Are” quote is from rawartletterpress, the airplane is from UrbanTickle (it says “I hope that even the sky is not the limit for you”) and the M is for Monkey is from SeaUrchinStudio. The cross was from Marc’s godparents on the occasion of his baptism. The other painting on the shelf was painted in 1999 by my flatmate when I was living overseas in Croatia. It’s a simple painting of the Croatian coastline and the colors work perfectly in the room! 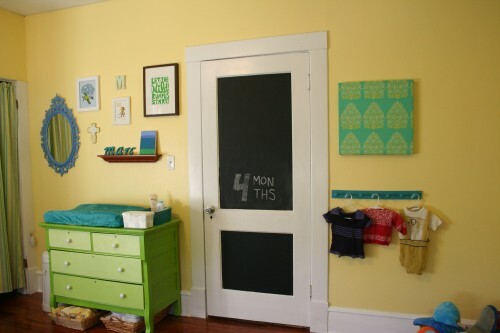 You can see the door wall here, where we painted the chalkboard door and where we do Marc’s monthly picture taking. 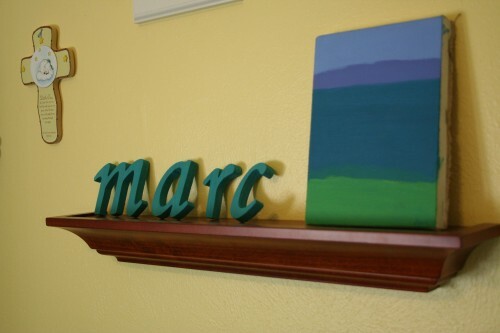 I painted an old coat hook rack that was originally in the room hanging on the door with the blue paint and when Marc’s old enough, he can hang his coats there. Right now I’ve got a few sentimental pieces of clothing hanging on it. The purple outfit was knitted by Marc’s godmother after I complained about how all the purple clothes were on the girls’ side of the store. Boys can wear purple! The red sweater was knitted by his godfather. It’s a gorgeous Scandinavian design and has a hat, mittens and socks that go along with it. He wore the sweater on his baptism day. The lion outfit belonged to Marc’s uncle – his namesake – when he was an infant in the 60s. Sad, I know. 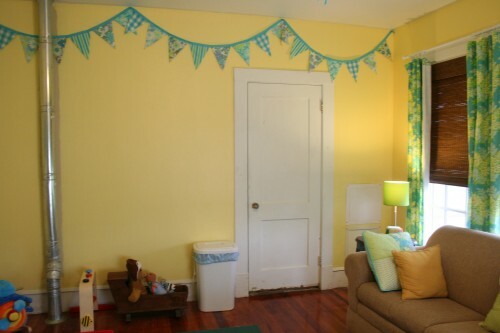 That green and blue bunting was actually the original inspiration for the room. It hung at our wedding and gave me the idea to do a room using green and blue. When this wall is finished, it will most likely still hang there, just over the wall of built-in cabinets that we are planning. Right now this wall houses the wet diaper pail (that door is the door to the bathroom where we rinse out Marc’s cloth diapers so it’s very handy to have the pail right there) and a few of Marc’s bigger toys. 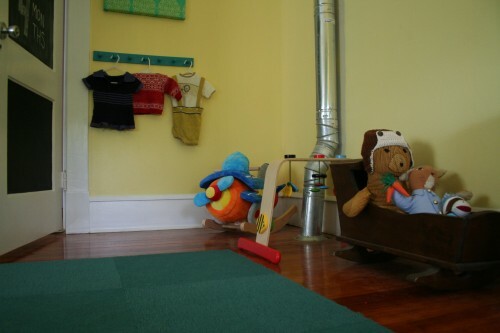 Oh, I just realized here that you can see the carpet that we have in the room in this picture – we chose teal carpet tiles from Flor. We ended up not making a full 8×10 rug out of them – I think Kelly wanted to show off more of the gleaming hardwood floors he worked so hard on! By the way, that cradle was made by my father for my sister when she was a baby! Now it is holding Roar Bear (my teddy bear as a child) and Marc’s special Peter Rabbit (made by my mother for my little sister) and a sock monkey. So, that’s the nursery. I’m absolutely in love with this room. It’s my favorite place in the whole house. It’s so bright and cheerful and happy and I think it reflects Marc’s happy little personality. 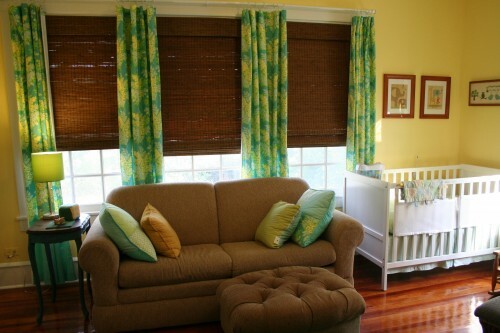 Even though the curtains are lined, we added some dark brown bamboo roman shades as well, to help block the light. Here is the single window all decorated. Once the wall of three windows is finished, I’ll put up a picture of that too. "Building Our Nest" is about one newly married couple's adventure in renovating their 1916 semi-craftsman colonial 2-story house in the Sanger Heights neighborhood of Waco, Texas.